My mom really hit it out of the park for a party and my daughter’s ballet “recital” this past weekend. But why wouldn’t she? She based her outfit on a real classic: the Chanel tweed jacket. Only hers wasn’t Chanel, but a reasonable facsimile by Sag Harbor. Pink tweed jacket, peach camisol style top, two or three long strands of pearl and gold necklaces, white linen trousers, gold thong style sandal by Madden Girl, white leather clutch, I’m not sure it was very Richmond, but she would have been at home in a larger city — she does live outside of D.C. in Alexandria. Everyone assumed she was wearing Chanel and she did nothing to discourage that assumption. Well, why should she? Chanel reworked her iconic tweed jacket in the 30’s, 40’s and eventually in the late 70’s whilst staying true to the slightly boxy silhouette. The collarless jackets, trimmed in braid with gold buttons and patch pockets featured a gold chain sewn into the hem to ensure that the jacket hung properly from the shoulders. And hang properly it did on many a society maven as the suits and jackets became the status symbol of the 80’s. But the reason that I think the jacket has endured is it’s flexibility. It is equally at home paired with jeans or linen trousers or the slightly below knee length skirt (the length that Chanel preferred). Tweed, as we know, travels very well. It is hardy stuff. Dressed up or down, suitable for ladies who lunch and/or hop the company jet across the pond, what more could the modern woman want? And that’s exactly the sort of garment that Chanel set out to create. Find one and add it to your wardrobe, if you don’t have one hanging there already. This entry was posted in Elegantology and tagged Alexandria, Chanel, D.C., Madden Girl snadals, Sag harbor, V&A. Bookmark the permalink. 7 Responses to Summer Tweed? Chris, your mother must have looked fabulous, and I see the apple did not fall far from the tree!! I have posted about an event at the specialty men’s clothier, Wilkes Bashford that may interest you and your friends. Absolutely agreed! 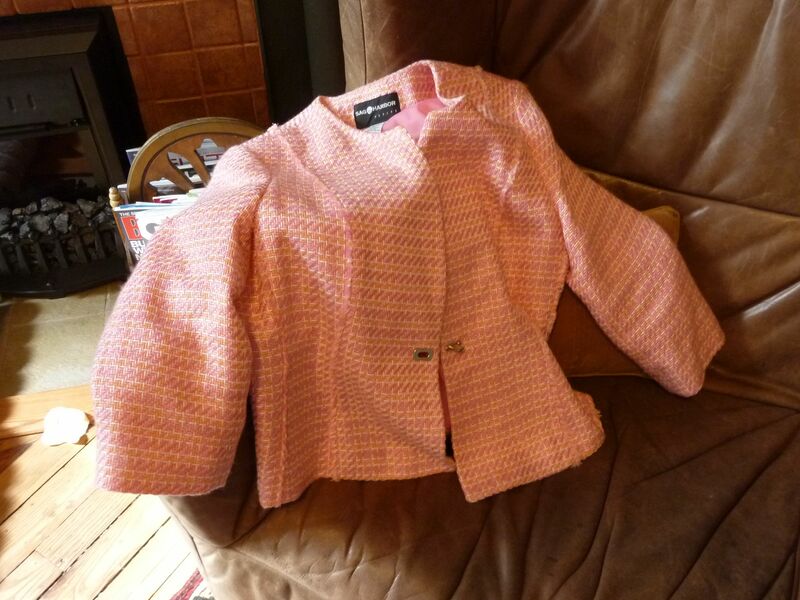 The Chanel tweed jacket (real or not), can work with just about anything and is definitely a piece to acquire. It sounds like you mother looked smashing in her ensemble! Always a pleasure to visit with you, hope you have a wonderful week! I have a number of ‘Chanel’ jackets in my closet – they make it so easy to polish up a tank or tee. They are perfect with jeans or dress pants. I would love to see your mom’s entire outfit! The color is yummy. I am guessing it was very flattering with her complexion, as I can’t think of a complexion that that peachy/salmon/rosy pink shade would not flatter. Lovely sleeve. Thank you for highlighting something for the ladies today–I hope you will more often! Unquestionably, the Chanel style jacket is the foundation of a modern woman’s wardrobe. In different weights, fabrics, colours, and proportions it can be worn for so many different occasions. Important to have a black one for evening. The buttons are a significant part of the look, and must be of fine quality. Vintage Chanel often has lion head buttons, and vintage ones often add distinction to a new jacket. Importantly, it can be worn by a female of any age or figure. That cannot be said for so many other short-lived trends. Perhaps that is part of the enduring charm of this fashion icon that has been around for decades and decades. It looks beautiful with a plain pearl necklace and pearl stud earrings.